Loblaws made big news recently with its $12.4 billion acquisition of Shoppers Drug Mart a few weeks ago and now its Hudson’s Bay Company (HBC) turn. The retailer announced it will acquire retailer Saks for approximately $2.9 billion, subject to regulatory approvals. Upon completion we will now see three retail brands coming together, Hudson’s Bay, Lord & Taylor and Saks Fifth Avenue. This creates a powerful brand that will extend across the luxury, mid-tier and outlet retail sectors. HBC will continue to build upon Saks’ market-leading position and identity as a luxury retailer. The combined company will operate 320 stores, including 179 full-line department stores, 72 outlet stores and 69 home stores in prime retail locations throughout the U.S. and Canada, along with three e-commerce sites. 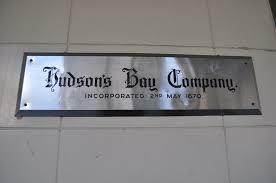 HBC has very deep roots in Canadian culture, founded in 1670, It was at one time the largest landowner in the world, with Rupert’s Land having 15% of North American acreage.